I love our neighborhood Thai Restaurant, Thai One On. They make the best Pad Thai I’ve ever had. I also love the little side dish of cucumber salad which typically comes with our order of chicken satay. It is so light and refreshing. The perfect combination of sweet and sour. Its no wonder several Asian restaurants serve similar types of salad using the same vinaigrette, most commonly with grilled meat. Now you can prepare this at home with SSL’s recipe for Chicken Satay with Coconut Peanut Sauce. Enjoy! In a microwavable small bowl (or coffee mug) add rice vingar, sugar, chili garlic sauce, and salt. Heat the bowl in the microwave for 45 seconds. Stir the vinaigrette until the sugar is completely dissolved. 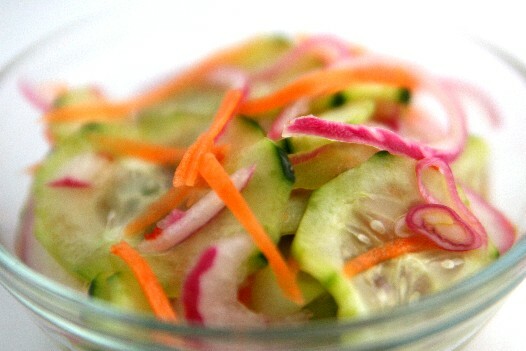 In a medium size bowl add the sliced cucumbers, carrots, and red onion. Pour vinaigrette over the cucumber mixture until well tossed. Cool in the refridgerator for 30 minutes before serving. Enjoy. Awesome refreshing recipe. Seattle food rocks!!! Served it as a side dish with shrimp and chicken. Found mandolin helpful for quick paper-thin cucumber and onion slices. Oh goodness, this recipe just NAILED it for us! I used slightly less than the 1/4 cup sugar and it was fantastic. Added a bit of ginger too. Even better than our fave Thai place; they use Thai bird chilis which are just TOO much. Thanks!!! Great recipe, thanks so much! I used a Splenda/sugar blend, and the flavor is just right. I’m keeping a bowl in my fridge permanently as a no-guilt snack! Thanks again for great recipes that you shared! I can’t wait to do all of these great recipes! My family and I enjoy different kinds of recipes, especially Asian. Thanks so much for sharing great recipes with us! Try adding some ginger to the mix. Sharp. I love Thai One On! They were one of the first places I ate at when I moved to Seattle, and, as a Thai novice, the first place I tried Pad Kee Mao, my #1 fave dish. Great timing for this recipe, it is definitely turning to light and cool salad weather. I like all of the ingredients in this and am always looking for something light to go with the heavy meats we cook at home. Thanks for the recipe! Your photo is beautiful. That salad looks and sounds fantastic! Love cucumbers. There’s this Thai restaurant near my house makes a really good version of this. Though, I don’t want to go there just for this alone. This looks very yummy!